Next weekend I'll be at the Green Festival in Washington, DC. helping Natural Zing at their vendor booth (I'm completely in love with Natural Zing because of their honest business ethics and commitment to having the highest quality products available---and the president is a truly beautiful individual). My dear friend RawBin will be picking me up next Thursday for a RAWsome weekend and I'll fly back on Monday! Read more: Green Festival and Raw Party! Ever since developing a personal conviction a few years ago that following a raw vegan existence was the best lifestyle for me, I've lived somewhat in conflict with the day-to-day corporate business environment in which I make my living at the moment. As we've directly stated many, many times, we're in the process of changing all of that. But, making such a huge change takes a long time because careers are in many ways very anchoring. We may write more about that process because it's true that going raw (or, really, adopting any kind of diet outside of what most other people eat) can lead to significant changes in your life. Between Wendi and me, I think we've gone through pretty much all of them, and there's certainly value and relevance in sharing most of those things here. Today, though, I thought I'd share what I call my "$75 Salad Story." In the business world, "networking" is among the more prevalent activities anyone does. It's pretty much always going to involve food , right? It's always a breakfast briefing, meeting a client over lunch, or attending a dinner party (complete with a cocktail hour). ?The deck is more or less stacked against you at these things because, let's face it, they're usually set up to provide what most people perceive as a pleasant experience. And, quite often, that means a certain degree of culinary decadence / indulgence -- invariably at venues that have never heard of raw chocolate or raw apple pie (which, to me, is 10x more appealing and exciting than the ubiquitous "chocolate fountain"). "Many Florida oranges are actually dipped in an artificial orange dye in order to make them more visually appealing. It's the same dye that's been banned for use in foods because of cancer risk." As some of you already know, along with regaining my physical health I've also been working on every other aspect of my overall health and being. I don't just want a healthy body---I want the whole package (vibrancy and bliss inside and out, in every way possible). One area of my mental health that has been slow to heal is my self confidence. I continue to work on it in many ways and have made some tremendous progress over the past year, or so. I feel worthy of so much more than I ever did before.Many people never doubt their self worth---they have a good sense of who they are and assume that others see them as they are, as well. I received an email from one of our lovely Pure Jeevan family members. 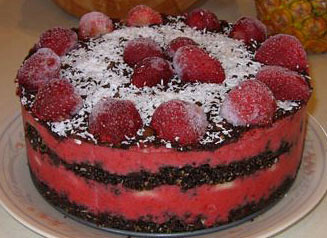 Joanne is subscribed to our mailings and she received the ice cream cake recipe I had created for Jim back in January. Well, take a look at what she did with the recipe! It's LOVEly! I took Jim's birthday cake recipe to the next level. Read more: Ice Cream Cake Recipe Alteration!